There is a paper bag. A hand opens it up, pursed like a pair of lips that seem eager to devour the delicious contents it is about to be filled with. Hands are pressed against the faux-glass plastic that sits between you and the cookies. Scanning your eyes across the flavours, you pick out so many variations on classic chocolate: Chocolate Chip, Double Chocolate Chip, Toffee Chocolate Chip, Triple Chocolate Chip. But there’s one more to choose. Raspberry and White Chocolate. 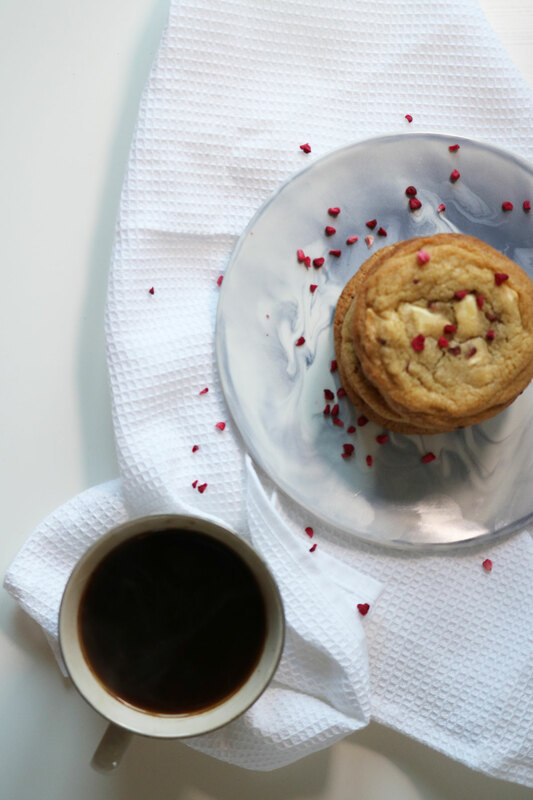 Fuzzy muted tones of bitter raspberry swept through cookie dough and piled high with white chocolate. Slightly caught on the edges, but the middle dense and chewy. Light and pretty, it is a cookie to be proud of. The perfect final addition to a bag of Millie’s Cookies. 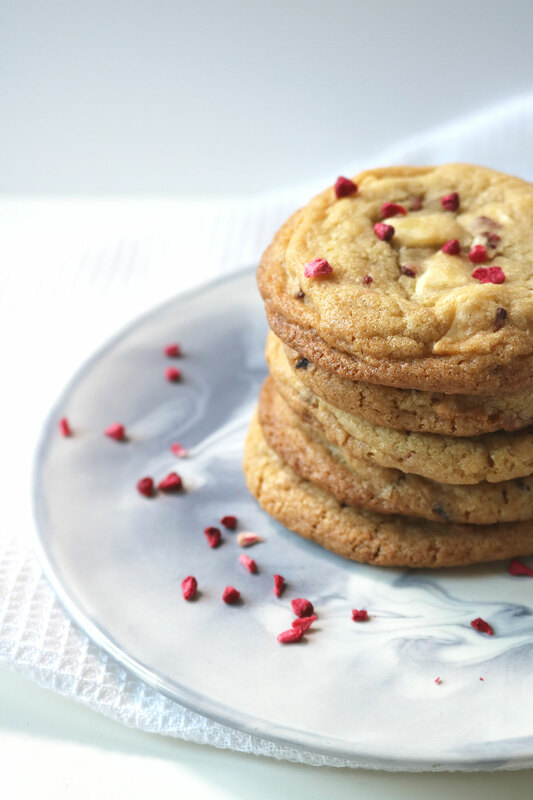 Raspberry and White Chocolate Cookies evoke memories of those teenage shopping trips with my family. My sister and I would snaffle the remaining two from a bag of five in the car home, but the first choice in the cafe was the raspberry. I guess when you are younger, you have inexplicable favourites, the way you have a favourite nail polish colour, favourite pizza toppings and a preferred Bacardi Breezer flavour. You don’t know why, but it’s the colour, combo and neon-pink of watermelon you always go for. I think I had forgotten about my teenage inexplicable favourites until I found freeze dried raspberries the other day. Parked next to a creamy packet of Chocolat Patissier Menier, the temptation was too much to resist. 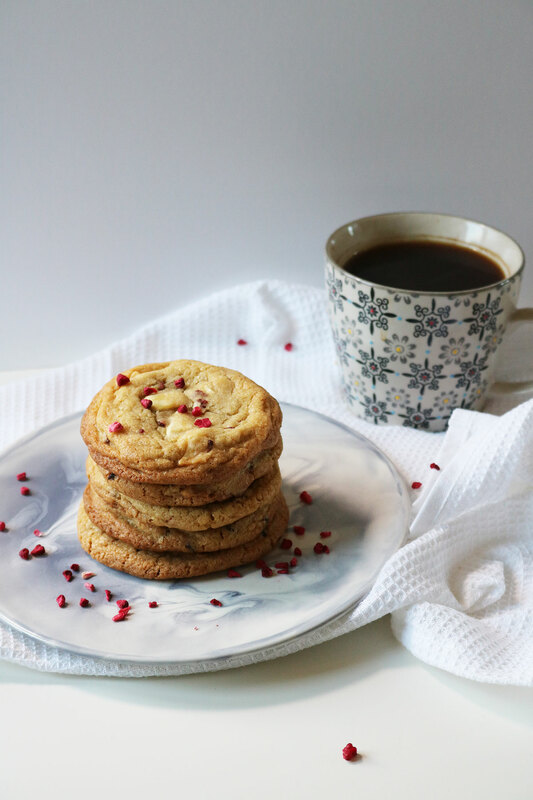 This version modifies my favoured cookie recipe, a slow-baked version that doesn’t catch the raspberry pieces the way they would on a higher setting. The brown sugar adds a caramel-like sweetness to the mix and the melting white chocolate oozes class. I may not be a teen anymore, but my inexplicable favourite has just grown up. Place the butter and two sugars in a large bowl and beat in a stand mixer or with a handheld whisk until the mixture resembles soft sand. Add the eggs and vanilla paste then beat again. 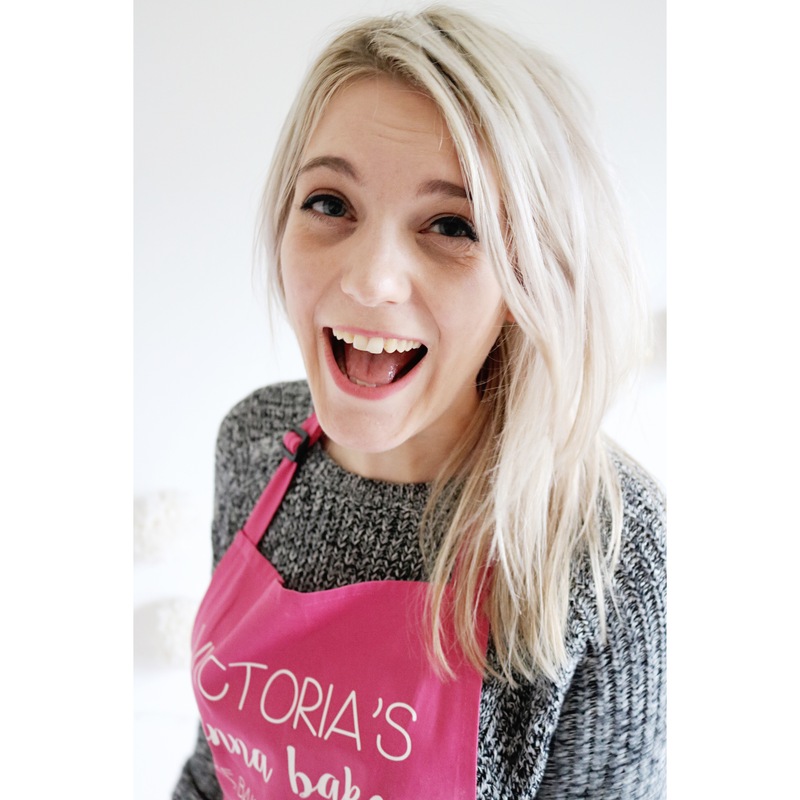 Whisk together the flour, salt and bicarbonate of soda then beat into the egg mix. Stir through the chocolate and raspberry pieces with a spatula until thoroughly distributed. Cover the bowl in clingfilm and refrigerate for at least 45 minutes. Preheat an oven to 180oc/160oc fan/Gas Mark 4. Line two baking trays with baking parchment and set aside. Remove the cookie dough from the fridge and weigh 45g of dough before rolling into balls and placing on the trays spaced well apart. You may have more cookie dough than you have space for on your trays, so store the remaining cookie dough in the fridge while you bake the first batch. Place the trays in the oven and bake for 10-12 minutes until the cookies are golden around the edges. Cool for 10 minutes then transfer to a wire rack. Sprinkle over any extra raspberry pieces and light press into the tops of the cookies for a little colour. Repeat until all the mixture has been used up. Once cool, store the cookies in an airtight container for up to five days. These look divine, I saw some freeze dried raspberries in Waitrose and wanted to buy them, now I will and make these! 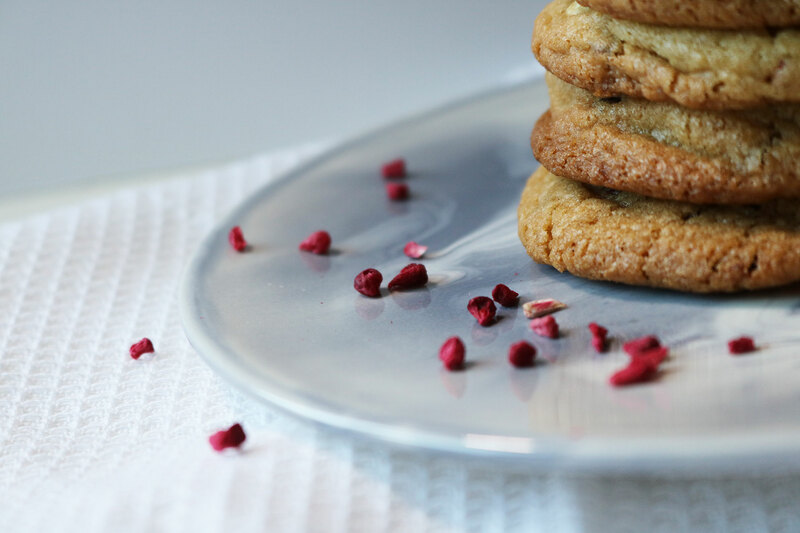 I love baking with freeze dried raspberries, I also found freeze dried strawberries and believe they would make a good strawberries and cream flavoured cookie! I just made this recipe, and the result was absolutely great! Soft, delicious, easy cookies that were gone within the hour! Thank you Jessabeth, I’m so pleased they were a hit! I made these yesterday to take to a friend’s Thanks Giving party, they went down extremely well. Everyone loved them! I made these yesterday, a little tip.. Make the cookies a bit thicker then you would usually. They don’t rise that much and you want them to be thick and not so firm. Mine came out some a little thinner and crispier than I would of wanted but the second batch was thick and soft. Yummy. Thanks for the feedback Nicole, I guess everyone likes their cookies in different ways! That’s a good tip thank you for sharing.